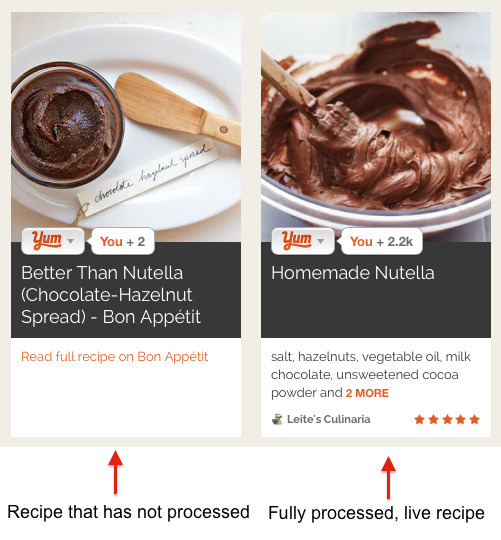 Your recipe will be added to Yummly when it is ‘Yummed’ for the first time. This means that we will analyze the recipe, identify the ingredients, nutrition (USDA), metric/US unit conversions, select a photo, etc. and link off to the recipe on your site for the directions. Please note that it will take anywhere between a few hours to seven days for the recipe to be processed and turn into a searchable recipe on Yummly. If you have Site Lock security on your website, we will need you to either remove it or have Site Lock remove the firewall from your site. SiteLock will likely ask you to get our IP address for whitelisting, but we are unable to provide that. They just need to remove the firewall from your site. If your recipes display no photo or the wrong photo: We suggest adding Open Graph Meta tags, specifically the og:image tag to the main image in your posts. This would ideally be the largest image in the post and also the image you would want to show up on Yummly, Facebook, or other sharing sites. Your recipes' star rating: Any recipe newly added using the Yum button for sites or the bookmarklet will start off with a 3 star rating. After that, the rating can increase or decrease after time based on a combination of factors, like number of Yums and Facebook likes. If you have any trouble adding or using the Yum button, send a request to our support team and include the url of your site, and any other pertinent links, details, and screenshots.